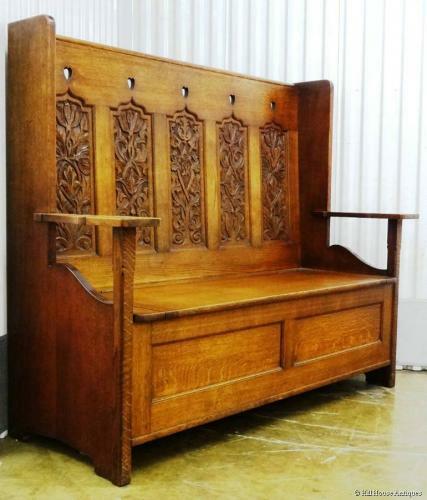 A superbly carved and beautifully designed, Arts & Crafts wide box settle in oak, by Arthur W Simpson of Kendal; c1900. The moulded top rail pierced with five fielded ogee arched panels of carved tulips and poppies, with pierced hearts above each. Shaped pierced sides, with typical Simpson broad flat arm rests, surmounting a two panel front hinged box seat, revealing that all important extra storage area! Carved monogram AM and the date of 1900 to the centre panel.